Here is our next submission from the last Friday Challenge for the Internet Movie Database Top 250. 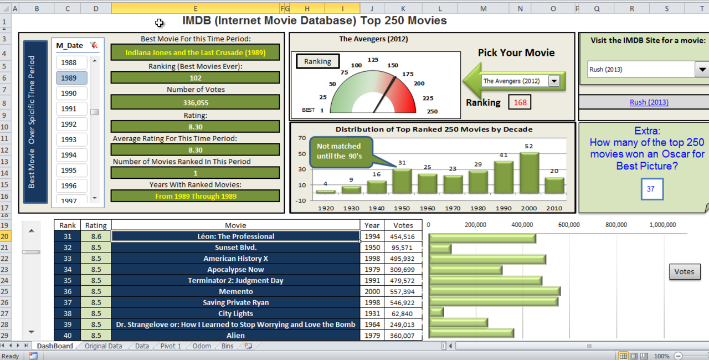 Below you can download an awesome Excel Dashboard entry from Don. Thanks again for the submission Don. I loved it! Great technique and vision of the data. Nicely done Don. I like the addition of the Oscar data. I sent in a revised copy with the extra years taken out of the slicer. The slicer was intended to pick a period of time (i.e. 1950 through 1959), not just one year at a time. I really like this dashboard, specially the odometer. Is it possible to make this with the color opposite? I’d like to have red where it’s green and green where it’s red. And in between the color yellow if possible. I have tried the “various color” but I can´t choose the colors that I want.I hope you can help me. That is a great question. It can be done, however, I don’t have a computer with Excel 2003 🙁 Maybe I can do it in 2007 and you can translate to how you can do it in Excel 2003. This dashboard is AMAZING! Any tips and/or locations on creating dashboard 101 would be appreciated!! !